I love having people visit me in Toronto – especially if they’re not familiar with the city. I appreciate their surprise at the city and always wait for the question – where should we go to eat? Its the universal way for any friends, new or old, to make a plan to meet. With this city, the dining options are unlimited, but there are easy ways to create barriers – like picking a neighbourhood or a type of cuisine. For the longest time, it was hard for me to find Mexican cuisine that was authentic. There was plenty of Mexican food, but the fresh and simple cuisine I experienced when in Mexico – few and far between. Thankfully someone suggested wanting Mexican cuisine and asked if I come meet them uptown, which prompted my suggestion of Frida Restaurant – an elegant restaurant that is as close to authentic in this city. 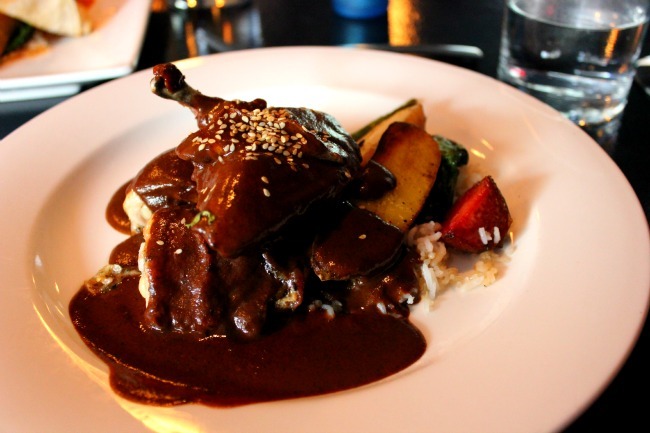 So we indulged in three courses – and my favourite was the slow cooked chicken with mole sauce. Tender chicken and smoky sauce especially on a Fall day. I’m reminded when I travel that I can come home to Toronto and have Indian, Middle Eastern, Thai or Vietnamese within a few steps of my apartment. There’s no lack of options. So when I travel, I do try to eat local as much as possible, sine the world’s offerings of food treats are easily found in Toronto.